Lara Casey is the founder of Cultivate What Matters as well as Laracasey.com. She's such a light and is so good at challenging others to redirect their focus and minds to right where they need to be for the day. What growing slow means, especially in a world of right now and instant gratification. How you can determine the goals you need to move forward with or move away from by evaluating their value in your life. Ways you can overcome challenges with your calendar and the value of getting intentional with it. What PowerSheets are and how they can help you reset your focus. 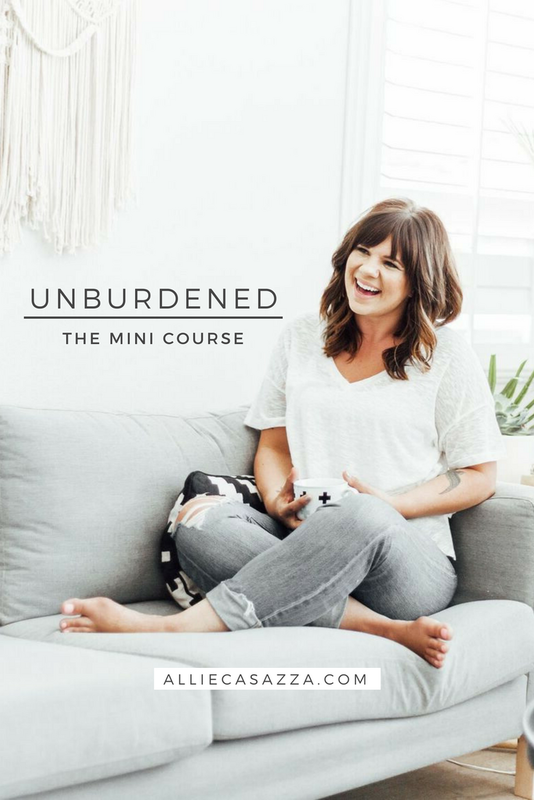 Unburdened is the overwhelmed beginner’s guide to a simpler motherhood. In Unburdened, I will walk you through how to stop over-complicating, procrastinating, and just start making positive changes now. How to declutter, just a little bit – not super deep into it, because you can’t handle that when you are this overwhelmed – but a surface declutter that will get you real results in your house so you can clean up less. who doesn't love a GIVEAWAY? Reviews are everything on iTunes! Would you take a minute and click here to leave a review? Email hello@alliecasazza.com with a screenshot of your review on iTunes. You'll be entered to win one of Allie's amazing courses for FREE! If you have a question, comment or a suggestion about today’s episode, or the podcast in general, send me an email at hello@alliecasazza.com or connect with me over on Facebook & Instagram. Mom life. We are surrounded with the message that it’s the tired life. The no-time-for-myself life. The hard life. And while it is hard and full of lots of servitude, the idea that motherhood means a joyless life is something I am passionate about putting a stop to. I’m on a mission to help you stop counting down the minutes till bedtime, at least most days. I want you to stop cleaning up after your kid’s childhood and start being present for it. Start enjoying it. I believe in John 10:10 “that we are called to abundant life” and I know mothers are not excluded from that promise. Join me in conversations about simplicity, minimalism and lots of other good stuff that leads to a life of less for the sake of enjoying more in your motherhood. 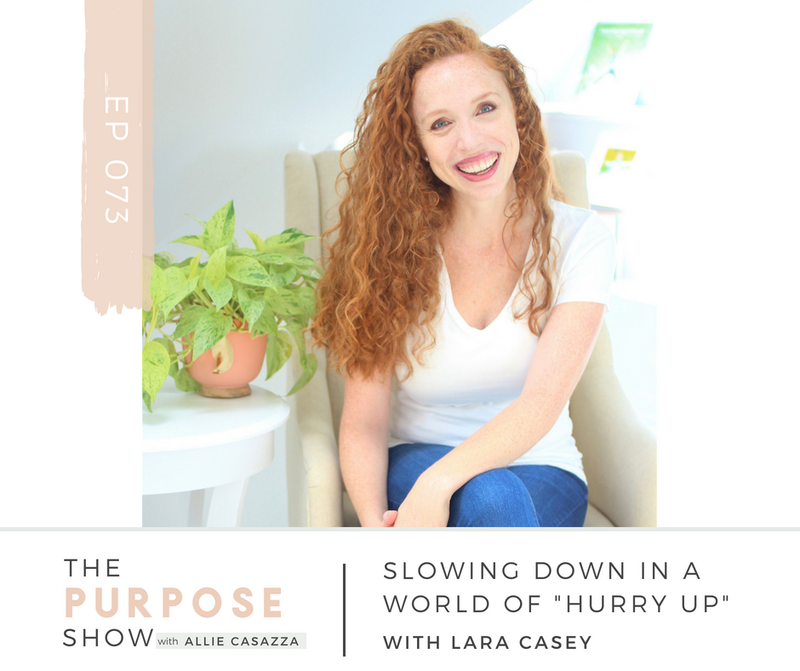 I’m Allie Casazza and this is The Purpose Show. Hey friends! Welcome to another episode of The Purpose Show. I'm so honored to show you the conversation that I got to have with our beautiful guest today. Lara Casey is the founder of Cultivate What Matters as well as Laracasey.com. She's such a light. She's just a gem. We've sat down and talked before and I always just feel the joy through the screen when I get to spend a little time with her. This episode was hard to title because we talked about all kinds of things from homeschooling to goal setting, just random. I feel like it was really, really good. We talked about your calendar, just being intentional in different areas of life, and it's just a gem of an episode. So, join me in welcoming Lara Casey. LARA: Thank you! So glad to be here! ALLIE: Awesome! I'm so glad we could finally connect. You guys, we had to reschedule and try again a hundred times to get here today because that's what happens when you’re business-owning, homeschooling moms of little children. I just want to dive right in. I was saying before we hit record, but your blog is really one of the only ones that I read regularly. I love it. You are so light and you get my brain redirected right where it needs to be for the day. I love your blog posts. I love your emails and look for your name. You're just an amazing writer. LARA: That’s so encouraging to hear! You know, I feel like it's easy to get lost in the does anybody actually read this? I'm not sure. So thank you. That's very kind. ALLIE: Of course! So on your blog, it wasn't too recently, but maybe a few months ago you said something that I love that I really wanted my listeners to hear. It was about setting goals midyear. You've talked about that a little bit before and because of you, I will kind of do a mid-year check-in with the intentions that I had set in January instead of just dropping them in whenever and forgetting about them. I really loved it. I love talking about that and kind of helping people break free out of that like fresh start syndrome trap. So what you said was you make a move forward list. Can you share about that idea? I just think it's so helpful and interesting. But we grow and change just like the flowers in my garden do. They grow and change over time and we do too. And so I think there's a really wonderful opportunity, not just, you know, halfway through the year, but every few months to stop, reevaluate, and say, “Is this thing that I've been spending my time on, this currency of my heart on, is it really worth it? Am I doing it well? Am I getting sidetracked by something? So, I feel like there is an opportunity to move forward either on the things that are worth our time or to move forward and just move away from the things that are not worth our time. So halfway through the year, and really a lot of times throughout the year, I ask myself that question. Where do I need to move forward? What do I need to let go of? What do I need to be pressing into? It’s a good opportunity to change and shift. ALLIE: So have you done the enneagram? LARA: Yes, I'm a one. I'm definitely a one. ALLIE: I'm an eight and so I find myself really… If there's instructions set for something and I know it works, I have a really hard time thinking, “Oh you could go off of that though. Like it's okay to go off of that.” I just, I don't know, I'm kind of logical. It works, so why would I… I don’t even have that thought. And so, I beat myself up though. I'm an oldest child and so I kind of have to do the perfect thing. And those together, it's like “but this is what I set.” And I just think that the way you speak about that, it has brought me so much freedom and just, “but what's working right now?” I was a different person in January. It's crazy to think that way. LARA: Yeah. And our kids, they change too. For me, a lot of it is how am I shifting to meet the needs of my family? And it's not just me changing but one child has a specific need in one season, or we're dealing with specific emotions. I think we can get (and I know I can get this way) so set on the checklist. This is the plan. This is what we're supposed to be doing right now. Instead of just looking at the needs that are in front of you and looking at the opportunities that are right in front of you. I'm all for intentional forethought and really sticking to something that really matters to you and pushing through the hard stuff, but there are some times you just need to redirect. ALLIE: So you talk a lot about growing slow and letting things take time. And comparing that to your gardening, which I love. I think that goes so hard against today's culture of right now and instant gratification and all that. Tell us about that and what exactly does that mean “growing slow.” Maybe an example of how you're doing that right now so we can kind of understand. LARA: Yeah. There was a season where we had two tiny babies at once. So I had given birth to my son Joshua, and then six months later we adopted our youngest, Sarah. I mean if you even have one child… it’s not just about having two kids, but any season like that can be tumultuous. And I just remember feeling so much defeat in that season. I mean it can really break you down as a mom to be trying to balance a business and two really young kids with really strong needs. And then I had a 4 ½-year-old at the time who was going through a lot of big emotions with that transition. And so, I just found myself in despair a lot and just thinking, “I am really just trying to survive right now.” I feel like there are these wonderful things that I want to do with our family and these qualities I want to grow in our children and I feel like I'm just complaining all of the time. And so, this thought came to me that I don't really have a choice to grow overnight. I can't. I don't have the time for it right now. It sounds funny to say. I know it's kind of a trite thing to say, but even I can't get in the shower most days, you know? It's true. And I started to practice, truly practice out of necessity, this idea of little-by-little progress adding up. I just thought if I could just sit with Grace, our oldest, for five minutes on the floor without the other two attached to me for a few minutes, maybe that would add up. And it takes a lot of trust. It takes a lot of faith to believe in the little-by-little progress adding up versus the overnight because overnight is easier to see. It's easier to see a result when you (this is the weirdest example, but I'm such a homeschool mom in this way) when you do the flower dyeing experiment, where you take a white flower and you stick it in the flower dye, you know? It's really easy to see a flower that goes from white to pink the next day. But the little-by-little over time is harder to notice. And so for me, that's the practical that I learned in that season that it's always worth it to take the five minutes. Yes, it will add up over time. No, you will not see the fruit of that as fast but the fruit will be sweeter in the end. ALLIE: What comes to mind when you're talking about that is that I know obviously you're a business owner. I know you're a working mom. For me my journey with being a working mom was very sudden, like, bam! Change! You’re not stay-at-home anymore. And it's all good. I love my business. I love what I do and I'm passionate about my mission, but a lot of the times (I'm working through this right now) I find myself feeling guilty for having that passion. You're just so good. I know that was a total shift from what I just asked you, but it just came to mind because you're so good at being okay with things being the way that they are right now. And I think you've even talked about being a working mom and like it's okay if your schedule is full of work, you're doing something good. And I think I'm so in need of that water on me right now and I know there's so many moms listening, but it's just a constant thing…work/life balance. I was traveling for work the other weekend and I got asked at least twice that I can think of, “Who's with your kids, though?” When my husband is traveling, nobody asks him that. And so, it's just that kind of expected guilt (we're doing something else?) and I would just love your thoughts on being a working mom and having a calendar. Right now, my calendar is full of guest interviews, writing, and planning and there's not a lot of family stuff on there this month. There was last month. How do you deal with all of that? LARA: Yeah, I feel like it's a complex answer. I don't really have a formula to offer people per se because I really feel like it's wherever the Lord has you in that season, that's where He's got you. I feel like for me personally, I just had this realization last week, I'm going to be in a perpetual season of saying “no” for a long time. And what do I mean by that? I mean that for many years I worked at the detriment of my family. Even before we had kids I worked 24/7 because I equated my work with my worth. And then when I had kids I was so entrenched in my work that it was very difficult for me to let go of that. God has just been constantly teaching me that letting go is where He needs me. I could go into a whole other story about that, but for one I have full-time childcare right now, so I'm not doing this by myself. And I do believe that us as parents, we have the utmost responsibility and calling of pouring God's light and love into our children more than anybody else. But there are also opportunities for other people to be in their lives that also enrich them deeply. And so, we consider our caregiver part of our family. So there's that. But the other thing is I really do feel like, for me personally, I just can't do it all and do it well. I have to disappoint friends when they want to get together because I'd rather just sit on the floor with my kids and play Legos. I can't go to social things all the time. We have to sometimes split even going to church family group because somebody has to be here while the kids are sleeping, you know? And so, wherever anybody is that’s listening to this, it's just the act of learning that saying “no” to one thing means you're saying “yes” to something else. And it's a constant balance because I feel like the needs are constantly changing, not because there's some static ideal that I feel like every woman should reach. It's just again, for me personally, I feel like it's wherever God wants you to be in that season. And for me right now, the work/life balance, the motherhood, the way I get the guilt out of the way is by being obedient and sometimes that means disappointing a lot of people. Sometimes that means even saying “no” to a work project or I could go on, but it means that you're not going to be in a position of ease, but it will be worth it. ALLIE: Yeah. For sure. And you gave me so much freedom in something you said recently where you talked about that if your calendar is full of work stuff right now, that's okay because you're doing something big. You're providing for your family. You're doing a different part of your mission. It's not supposed to all be one thing in your life all of the time. LARA: Most definitely. And I have not just single mom friends, but working mom friends who are married, all kinds of different people in different life places who God has put them in a place where either they need to provide for their family or they've been given a calling in something that is for the Kingdom or whatever it is. Again, it's hard for me to give a formula or a blanket answer, but if you're feeling the guilt, I think there's an opportunity to be curious about that. Just to say, “Lord, am I feeling guilt about this because… (like you experienced, there was a cultural pressure that pushed in on you) am I feeling this because I actually do need to spend more time with my kids or I actually do need to say “no” more? Or am I feeling this because…” I don't know, it could be a million reasons. I think it's not just a one size fits all, like you ask that question once at the beginning of a season and then you figure out this perfect schedule and then you're done. For me it's a constant. It's like an every day, like, all right, I'm going to spend four hours with Grace doing homeschool today while our caregiver is taking the kids to the park or whatever, and then I know I'm going to spend time with them when they get back. It's just a constant balance. ALLIE: Can I ask a practical question? How often do you usually spend on school? What's your guys' homeschool schedule like with everything else you have? LARA: So I essentially work part-time if we're being technical. This is my first year, but we do school two long mornings a week and then Grace goes to a homeschool school for History and Social Studies two other long mornings a week, something like 9:00-1:00 or 9:00-2:00. And then Friday is a free day. So that's the way we're doing it for Kindergarten/1st grade. It may increase as we get, you know, further along. But yeah, that's how we do it. And then the other two are just about to start preschool so they’ll be in preschool two mornings a week as well. And it's during those time blocks that I'm usually going to have meetings or longer periods of work. ALLIE: Yeah. I just like hearing how other people make it happen. I'm a really relaxed homeschooler or like very Charlotte Mason, like read a lot, talk a lot. This year my daughter's going into fourth grade and so it's starting to get a little more… legit is the wrong word. It matters more, it feels like. And you have to know all these things that are not exciting and are not going to get accomplished by reading a book. My husband and I share the load and so we just went over like, “there's like little pieces of Algebra in the book this year. How are we going to do this? How are we going to schedule and make sure we actually…?” I feel like this just now (she’s 9) is the first year where it's actually like, “okay, we need to make sure we're doing Math every day.” It's kind of refreshing though because sometimes being super free is difficult. LARA: I totally understand that. Yes. I feel the same way. ALLIE: It's a journey for sure. Okay. So, I'd love to talk to you about getting intentional with our calendars. And you had recently, I think really recently, you did a workshop about calendars and all that, which was amazing. By the way, is that something that people can watch still? LARA: Yes. It’s free. It's called How To Cultivate Your Calendar. ALLIE: So what do you think, what would you say are the major challenges that women and mothers specifically are facing when it comes to putting things on their schedules? LARA: I think we just kind of go through the motions with it. And that's a hard thing to say because when I say “go through the motions” many times we look at our to-do list or the things that are on our calendars and we do not ever consider that they could change. We think, “Nope, I've committed to this. This is just the way it is. This is the way everybody does it. There's no way to fix this. There's no way to make this better.” And I've had that feeling and that thought probably 99% of the time, but then there's the 1% that's changed my life, which is actually maybe you could do it differently. Maybe a little intentional forethought really goes a long way. And so rather than letting your calendar and your schedule get filled up, being proactive and looking at a year period ahead of time, like say next week you decide to look ahead at the first quarter of 2019. I just did this this weekend. I just looked ahead of the rest of year. I just literally went day-by-day and I thought to myself, “okay, I need to buy a birthday card for this, and I’m going to need to get a babysitter for this” and I just went through and cultivated the calendar. So, cultivate means to prepare for growth and to till up the soil for good things to grow and to cultivate our calendar means to be prepared. It doesn't mean that you have to have a perfect birthday celebration plan for someone or something elaborate. It's just the act of having forethought so that you're not coming up to (and I'm speaking from personal experience here) coming up to friends’ birthdays or friends’ anniversaries and you're like, “oh my goodness, I completely forgot” or “I have no time and now I have to spend X amount of dollars to buy this last-minute gift to overnight to them” or whatever it is. I think being prepared, and when I say prepared, I mean just slightly prepared for these things, having a little forethought helps us to feel confident about loving other people well. So, to answer your question again, biggest mistake I think people make is thinking that they have no control over their schedules. Yes, there are certain things that are set like a 9-5 work schedule or a childcare schedule or whatever it is, there are things that are there. But all the things around it or the way you even prepare for that period of time, planning lunches, I could go on. ALLIE: For us in our family, we go into different “batch” seasons of rest and fullness (I won’t say busyness). We just came out of this really relaxed season of rest. We took a lot of fun day trips and ended up driving to San Diego and then staying in a hotel for a couple nights unplanned and just being at the beach with the kids. Now school is starting and we go thru a charter school so they kind of help us organize (you should probably start school now) and softball, baseball, piano, horseback, all the electives. We've been really careful with what we say “yes” to and what we're like, “Yeah, I know you're interested in that, but it's just not this year,” but it's busy. It's full. It helps me, at least. I'm super introverted and so going to all these different things just exhausts me. It sounds so “Madonna” or whatever, but knowing that we just had such a restful season and I'm preparing, like you said. I have cultivated our calendar and our schedule where I know we're going into this and I can kind of gear up and then I know it's going to end. And then it's going to be the holidays and it's time to be with family again. I think if you're not constantly busying yourself and saying “yes” to everything out of guilt or obligation or whatever it is, that having those periods of rest makes the periods of fullness so much more joy filled. LARA: Yup. Yup. I agree. We were created for seasons. We were created for these ebbs and flows, not just in the literal seasons like fall and winter, but we were created to have a rhythm of rest and work. And I feel like work gets a really bad rap, but we literally were created to work in whatever capacity that means, whether it's raising children and being a love at home mom or it's doing that plus doing whatever part-time job you have from home or whatever it is. We were created to work, but in that we have to have the combination of rest. I mean not to just keep using that biblical example of God rested one day a week for the sabbath and so if He did that… That was really just an example for us. It's not like God needed to rest. He needed to give us that example. I think that that's a main component of cultivating your calendar is looking ahead and saying, I know I'm going to have this season of pushing really hard or traveling or like you said, having a very full season. What can I do to combat that or prepare for that? How can I lay low after that so my batteries can recharge. And that's really loving yourself and your people well, you know? It's not being self-indulgent to say, “I'm not going to work on those Fridays after that,” or whatever. Yeah, I think it's proactive. It's great. Do you feel like you are barely getting through your days friend? Does motherhood feel more like a hurricane of chaos that you are just surviving rather than the awesome, joy-filled season that you want it to be? Well, motherhood is hard. I am not going to lie to you about that. While it is servitude and giving to your family from yourself, it doesn’t have to be something that we are waiting to be over. Something that we are counting down the minutes till naptime, or bedtime, or waiting for the next day to start. If you are wanting to sort through the clutter in your mind, your heart, your home calendar, your health, routines, and relationships, I created Unburdened just for you! It is a guide that will help you go from drowning in the sea of stress and overwhelm, to owning your time and living the best version of your motherhood. So you can live abundantly while intentionally focusing on those who matter most. How to declutter toxic relationships in your life and set some good boundaries. How to simplify cleaning, get healthy and feel better – finally! How to simplify your calendar. How to start owning your time and not just managing it as life happens to you. How to stop just setting goals and letting them sit there. Start actually defining where you want to go and getting there through reverse engineering and goal-setting. How to create a cleaning routine that works for you and your life. This course is a mini-course. It is small. It is straightforward. But it is everything for the mom who feels like she needs a total overhaul, but is too overwhelmed to start. It will help you simplify the things that have you stuck and leave survival mode behind for good. Is this resonating with you? Sound like you? Does this sound like something that would really help you right now? Go to bit.ly/getunburdened. I really poured my heart into this little course. I created it for the mom who is really wanting to simplify, declutter, and pursue a life of less, but she is so burdened and overwhelmed with the mess of life. It’s not just her house. She wants to simplify at the surface of all the different things in her life so she can focus on her family more. So then she can focus more on really, truly purging her entire house. If this sounds like you, I encourage you to check it out. You are probably the person I created it for. I want you in there. I want it to help you. ALLIE: So I'm just wondering, practically speaking, paper planners, planning things out on paper versus digital, how do you handle that? Do you do one or the other or how do you do that? LARA: In our office we use ical, just the regular apple calendar program because it syncs with everybody's phones and their desktops and stuff. Then for our family day-to-day things, not for necessarily like planning on the calendar, but day-to-day they have music class at 2:00 or whatever it is, we use a paper calendar and that just stays down in the kitchen all the time. That's more to look at what are the needs for this specific day. And then I use my Powersheets, the goal planner that we created from Cultivate to inform my calendars. And so that's really where I have my list, if you will, of all of my priorities and I transfer action steps from that into both the digital and paper things. ALLIE: I love them. I use them. I have mine right here. It's in my desk. All the time. LARA: That's awesome. I love it! ALLIE: First of all, the work that you have us do in the beginning, before the year, is so deep and amazing. You ask questions and I'm like, “I never would've thought of that” and it matters so much. I noticed a lot of changes in this year’s from the one before and you're always making them better somehow. But you leave a lot of space, too, for it's almost like encouraging notes for myself when things might get a little hard. Sometimes you’re looking ahead. What's going on this month? What do you have going on this month or whatever. What are your goals? And sometimes I get overwhelmed beyond all belief and you give us permission to slash and say, “Nevermind. Actually, I can't do that. I'm not God. I can't do that.” And to write encouraging notes for myself like, “This is going to make your stomach turn. This is a big interview or this is a big thing. It's okay. You got this. Remember to breathe.” Just little things that seem silly. Just having that in front of me on my desk all the time is, it's really a gift I love your Powersheets. LARA: I'm so encouraged to hear that. That's awesome. I think it's just easy to get lost in the woods, you know, and feel like you don't have reminders of where you're going. So whether it's Powersheets or a note you put on your desk or a post-it note on your refrigerator or whatever it is. I have my Bible here on my desk, or a note written in the margin of your Bible. Having a reminder of where you're going and what's most important. That is the key to cultivating your calendar and doing all the work/life balance. If your “yes” is not super clear then it's going to be very difficult to say “no” to things that are going to get in the way of that. But when you're “yes” is super clear, it is very easy to say “no.” So yeah, it's a good reminder of where you're going and what your real priority is. ALLIE: Yeah. So, kind of jumping back to homeschooling real quick, (I just thought of something) I feel like in the homeschool world there is so many things that claim to be “the thing” you need to do or to have in order to succeed and it is scary and no matter how confident you are or what you believe, there are times where it is scary to be educating your kids. It’s a big load. And so, I feel like sometimes homeschooling feels like an area where I'm not doing enough or it could be better. Is this the best thing for them? And that's exhausting. And also homeschool progress is slow progress. It’s such a life lesson. It's reflective of a lot of things, but homeschooling is just really slow. There’s frustrations and they're not sitting still. We were doing a doing Joan of Arc the other day. First of all, I didn't know all this stuff about Joan of Arc. The lesson that I learned was very watered down. She was amazing. I've got three boys and a girl and my boys were like obsessed that she got burned at the stake. They're fixated on this. How did they do that? And I'm like, okay, can we focus on the part of her faith please? It's just frustrating to teach little kids. So anyway, all that to say, and this is really general, so take this wherever you want, but how have you gotten intentional in your homeschool and how are you patient with Grace and how have you gotten intentional with what you say “yes” and “no” to? How do you kind of guide yourself in that? LARA: I feel like I'm so new to this and so green to it that I am learning all the things that you're describing right now, but I don't know if I could say this really well, but homeschooling is essentially like constant parenting. I mean it's like a concentrated form of having to deal with all of your own insecurities, your own challenges, your own patience and also your child’s in a big melting pot. So, if you just amplify all the hard things about parenting, they all kind of surface the moment homeschool starts. So, I think the one thing that I have to do, and I know this sounds general, but I have to pray because I feel like if I go into a homeschool day with my brain elsewhere or with my brain on here's all the things we're going to check off our list today, I miss so much good stuff. Like today, we have this great book we use that’s a hymn study book and it's a pretty academic book. It basically tells the stories of the different hymns. Then you get to go through the hymn. We were reading about Joy To The World and if I were following a (yes we follow some sort of checklist) really hard-line checklist, I would have missed the amazing conversation that we had today about different translations of the Bible within that whole thing. And we read my grandfather's obituary and talked about family history because it all related to the story of the song. ALLIE: You learned more than being burned at the stake? LARA: There's so many things I could say. One is just to trust that our kids are probably smarter than we think they are. And to trust that your little-by-little effort will add up even though they are whining and complaining and all the stuff in between. This is not a statement about home school versus public school or any other school, but for me homeschool is the best opportunity I have for sanctification with Grace right now. It refines my heart. It challenges my faith and I think it's opening her eyes in that way too. So, I just can't imagine a better opportunity for that. I mean you don't learn a whole lot through easy things. You'll learn a whole lot through hard things and it's through the hard stuff that good things come. That was a long answer to your question, but the answer is I'm learning. ALLIE: Recently this year I learned that I don't have to be the best. The best option. Everything I choose is the best. Yes, this is it. Actually stopping that thought and instead I'm showing up. I'm showing up and this looks great. It feels right. I feel peace about this choice for this curriculum or this book or whatever. We're going to go with it and just letting go of that need to be better than school. It's not a competition. LARA: It’s not. No. And I think our kids feel that when I feel that way. I know Grace feels that when I think, “Oh, she's behind in reading” and I'm operating from that place, she doesn't learn, you know? But operating from a place of hope, trust and belief and seeing the good in all the hard stuff too. It makes it so much more fun. ALLIE: This episode is going to be difficult to title because we're talking about so many amazing things. LARA: It’s a hodgepodge of topics. ALLIE: I'm obviously fangirling because I know all the things that you do, but I would love to ask you about your Write The Word Journals. Is that something that you did in yourself and then those came out of it, like how did you come to create those? I love them. LARA: So the answer is yes. I have a, I don't know another way to say this, but I have a difficult attention span, I guess. I guess you could call it a creative attention span where I'm a visual learner. I have a really hard time sitting down with a big chunk of text. I feel like I have to hear it or I have to see it or I have to do something with it for it to come alive. And so, I remember just praying one morning and thinking like, “Lord, I really want to connect with your Word and I really want to make it real in my life. I want to plant it in my heart.” And this idea came to me of writing the scriptures. I thought, well, my intention can't go anywhere if I'm writing it out and I feel like I will meditate on it more if I'm literally using my messy handwriting to write out Bible verses. And so, I started doing that for myself. I now, many years later after having created the first Write The Word Journals, which is basically a blank journal that has a preselected portion of scripture based on whatever the theme of that journal is that just leads you into scripture and obviously the journals tell you to read it in context. It's just a great way to get directly into scripture, but then also to slow your brain down. Not just quickly digest it but really let it sink in. But here I am now on the other side of this realizing there's so much research and science behind writing the Word, whether you get The Word Journal or not. Just pick a verse and find a scrap piece of paper and you will see this fact come to life. There was a study done where they took a group of students and the students that took notes on a laptop or an electronic device did not retain even half of the information that the students that hand wrote their notes out did. I don't know if you're like me, like I remember loving writing notes in college or in various classes or even sermon notes, but I hardly ever go back to them, but there's something about the act of writing them that solidifies the information in our brains and so it's the same with Writing The Word. ALLIE: I love that. We have the Write The Word For Kids Journal. I just have to tell you. Your team sent it to me and I was so excited and I gave it to Bella, she's 9, and I just kind of left it. I didn't say anything to her. Her light was on at like 10:00 p.m. the other night, so I just went in to turn it off and she was awake. She's so dang creative. She’s got that down. So her brain was just going and she's like, “I'm having a hard time falling asleep so I'm using this.” And it was your Write The Word Journal. And it was halfway full. She was using it and going to her Bible and just doing it. It was so cute. I know what verse she was thinking of and she put it in her own way. Honestly it was like, “What an amazing version! We're going to have to come out with a new Bible version.” It was just really, really neat to see. You’re creating things that are so impactful, that matter so much, that are guiding people and little kids and doing something that really matters. So, I just think that's so “me” and I had to tell you that story. It happened yesterday. LARA: That is really awesome to hear. The Write The Word For Kids I think has been my favorite thing we've ever created. Probably because I have a daughter who's going to be 7 soon and it's right up her alley, but I mean just the idea of planting The Word in kids' hearts and letting them have fun with it. Yeah. Thanks for sharing that story. That’s so cool. ALLIE: Okay, so where can people find more of you if somehow they have never heard of Lara Casey and Cultivate What Matters, where do you want to send people to kind of read more and find more about you? Yes. You can find me at LaraCasey.com and at Cultivatewhatmatters.com. ALLIE: Yes. Okay. Thank you so much for being here. It was really an honor to talk to you. I just love you and everything you do. LARA: You know this was such a joy. Thank you so much for having me. Hey friends. I'm so glad you were here to listen to this episode with Lara. If you want the link to anything that we talked about including her calendar Webinar where she teaches about having an intentional calendar and how to plan your schedule out (it's so, so good) go to alliecasazza.com/shownotes/073 and you can get all that stuff. We linked it all up for you, so head over there to get anything that we've talked about today. Hey friend, thank you so much for listening to this episode of The Purpose Show. If you loved what Lara and I talked about and you want to find anything that she mentioned or I mentioned that we linked to, you can find everything you're looking for at alliecasazza.com/shownotes/073. This was an episode of The Purpose Show. Did you know there is an exclusive community created solely for the purpose of continuing discussions surrounding The Purpose Show episodes? And to get you to actually take action and make positive changes on the things that you learn here? Go be a part of it. To join go to facebook.com/groups/purposefulmamas. Thank you so much for tuning in. If you are ready to uplevel and really take action on the things I talk about on my show, and get step-by-step help from me, head to alliecasazza.com. There are free downloads, courses, classes, and ways to learn more about what the next step might look like for you and to focus on whatever you might need help with in whatever season you are in right now. I am always rooting for you, friend! Hey mama! Just a quick note, this post may contain affiliate links. TAKE ONE OF MY GLOBALLY-PRAISED COURSES AND MAKE CHANGES THAT LAST. I'm very active on this social platform, so if you want to see how I actually live day-to-day and connect with me, this is the place!